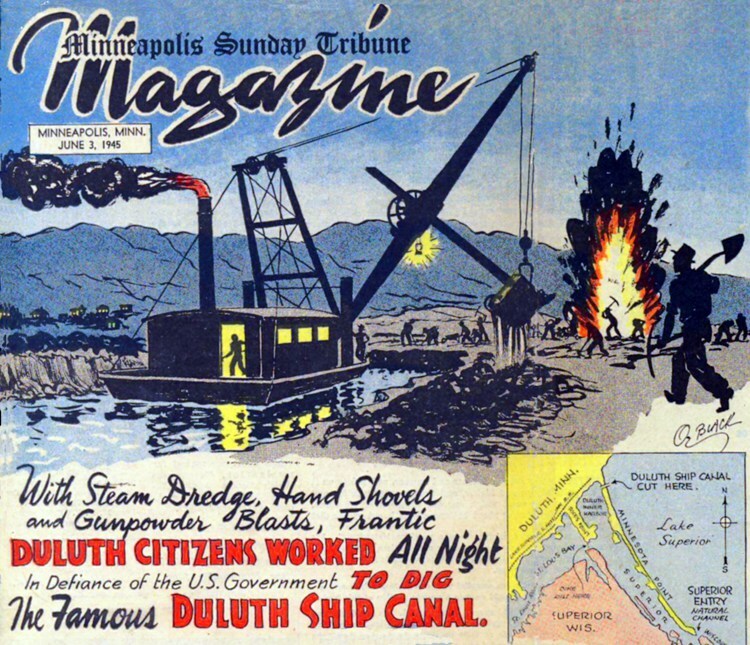 On this day in Duluth in 1871, an injunction designed to stop development of the Duluth Ship Canal—brought about by a request of the city of Superior, Wisconsin—was served to Duluth city officials. Despite what legends say, by then the canal had already been cut and developed into a waterway fifty feet wide and eight feet deep. The injunction did not require that the construction be stopped or that the canal be filled in, but rather that a dike be built so that the waters of the St. Louis River wouldn’t be diverted through the new canal and thereby fill the waterways to the Superior Entry with silt, essentially cutting off shipping traffic. The dike idea was a debacle, as it cut off marine traffic between Duluth and Superior. It was also never built to specifications and continually failed. At one point, an attempt was made to blow it up. Superior and the state of Wisconsin both sued Duluth, one to rebuild the dike to its proposed specifications and the other to remove the dike entirely to allow for marine traffic. The lawsuits finally ended in 1877. Read about the legends surrounding the digging of the ship canal here and about the legal fight over the ship canal here.